Backpack chairs are a great way for you and your loved ones to have comfortable seating at nearly any site. These unique chairs allow you to kick back and relax no matter where you are located. At Everywherechair.com we have a large variety of exciting backpack chairs for you to choose from. These chairs are perfect for games, tailgating or simply family events. You can find hundred of uses for our relaxing backpack chairs. The Original Backpack Canopy Chair by Kelsyus is the original and still one of the best. This innovative design features a tilt up full size canopy that gives full shade and protection from the elements. 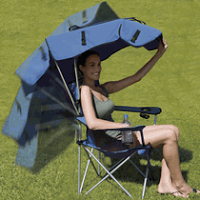 This backpack chair gives full 100 percent UV ray protection because of the unique canopy. An oversized seat and armrests will give you a relaxing, comfortable seating experience. Each armrest features a cup holder for your favorite beverages. The canopy locks into multiple different positions. Mesh utility pockets are located under the canopy. You can stash your keys, sunglasses or many other items. Simply fold the chair up when you are down and away you go. Padded backpack straps will keep you comfortable. Your kids can get involved in the backpack chair fun, too. The Wearever Kids Backpack Beach Chair is lightweight and durable. This unique kids backpack chair is easy to set up and carry. The backpack portion of this backpack chair has enough room for small toys or games. This kids backpack chair is perfect for the beach, family outings or taking to a friend’s birthday pool party. Right now you can take advantage of a great sale price and free shipping. The Kelsyus Backpack Event Chair is another exciting chair that will keep you comfortable at all your outdoor events and games. This chair features a striking color combination of black and orange. When unfolded this chair features a cup holder on the right armrest. All new for 2008 is a large zippered storage bag sewn on to the back fabric. Inside the bag is an attached pull out mesh bag for bathing suits, sunscreen and other essentials. Add all these features to the self-closing backpack design and you have a chair that is the ultimate in outdoor recreational seating. You can also add an optional canopy to your order. Doesn’t it seem like there are not enough hours in the day? With sports practices, work and family outings, it is nice to kick back and relax in a comfortable chair. Now, with these wonderful backpack chairs you can have a chair with you on the go. With the holiday season quickly approaching, now is the perfect time to take advantage of our sale prices. Simply stop by Everywherechair.com and find the backpack chair that fits your needs today.